Click the chart more more markets data. Investors did a happy dance on Wednesday as earnings, economic data and Janet Yellen brought good news. 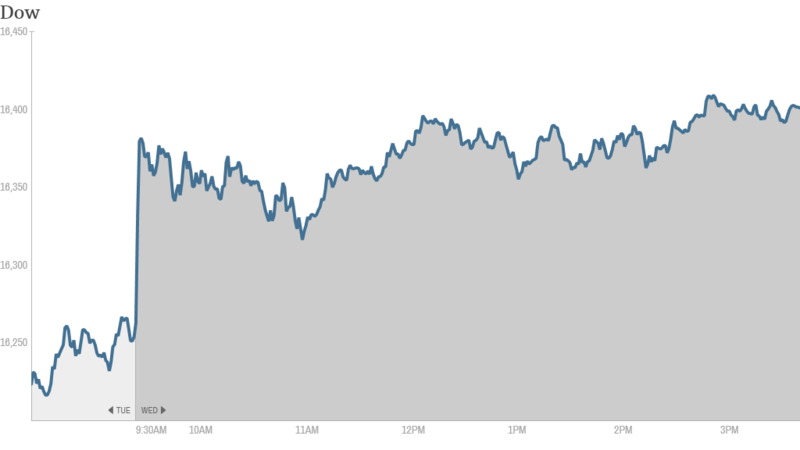 The Dow soared 162 points, while the S&P 500 and Nasdaq both bounced over 1%. Despite a lot of choppiness in the markets in recent weeks, Wednesday's gains marked the third consecutive win for the three major U.S. indexes. Federal Reserve Chief Yellen sent a clear message to Wall Street today to stop panicking about interest rates. "Interest rates will likely stay at current levels for a considerable time after asset purchase program ends," she said. Investors took this as more assurance that rates aren't going up any time soon, and the market held steady and then ticked up slightly after she finished her remarks. Earnings are the other big story today. After the bell, Google (GOOGL) reported earnings that missed analyst expectations. The tech giant said it saw a decrease in the average cost-per-click of ads posted on its site. Shares fell over 5% in after-hours trading. Yahoo (YHOO) surged 6% after the company posted earnings and sales Tuesday night that came in slightly ahead of expectations. Yahoo investors are also excited for the highly-anticipated Alibaba IPO. Yahoo owns 24% of the Chinese internet giant, putting it in position for a multi-billion dollar windfall from the deal. "Way to go $YHOO," said amigobulls on StockTwits. "What are you willing to do to get a 25% stake in Alibaba? Buy yahoo," said Catalystinvestor. Bank of America (BAC) wasn't having such a great day after reporting a quarterly loss stemming from its $6 billion in litigation expenses from a settlement with the Federal Housing Finance Agency. The settlement was related to the bank misrepresenting risky mortgage securities that contributed to the housing crisis. A few StockTwits traders were nonetheless optimistic on Bank of America's prospects. "We have known about the high litigation cost in $BAC for a while now. Look past it," said DanStarr. "$BAC Buy buy buy... huge discount smart investors will take advantage," said Crickshank. 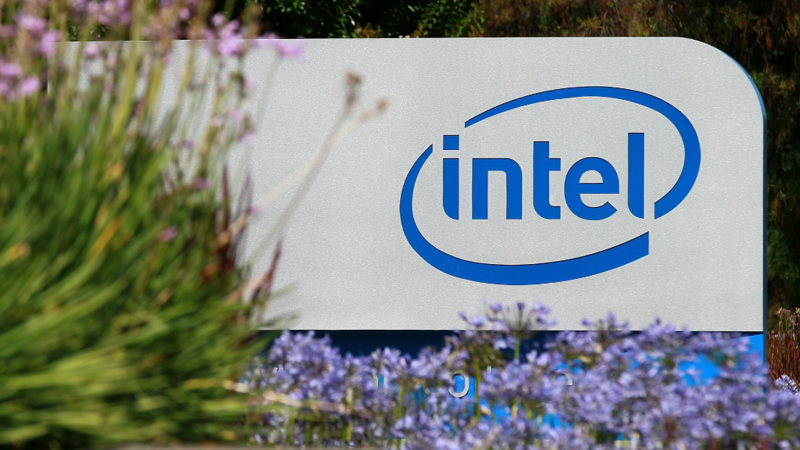 Intel (INTC) reported earnings that beat analysts' estimates by a cent. Its stock ticked up Wednesday. Aside from earnings, Chinese Internet giant Weibo is expected to price its initial public offering after the closing bell on Wednesday. The social media powerhouse, sometimes referred to as China's Twitter, is expected to sell about $380 million in stock, putting its value at about $4 billion. King Digital Entertainment (KING) is taking its popular Candy Crush Saga game to China. The stock shot up over 3.4% as investors imagined how many millions, if not billions, of bored Chinese would start playing. Shares of SodaStream (SODA)spiked after an Israeli newspaper reported that the soda machine maker is in talks to sell a stake to a major soft-drink company. But StockTwits trader danielmardorf thought the rumors were just that. "$SODA how many times people fall for same fake rumor ? Complete suckers," he said. In other economic news, the government released housing data that showed new home construction rose from February, though it was down from a year ago. Elsewhere, there was comforting news from China. The world's second largest economy grew at an annual rate of 7.4% in the first quarter. The major European markets closed mostly higher, with Germany's Dax index up by over 1%. Nearly all Asian markets ended with gains. The Nikkei in Japan surged by 3%.